Many folks that suffer from hair loss look for natural ways to treat their condition. This is no surprise — drugs that prevent hair loss may cause undesirable side effects in some users. Do natural DHT blockers work? How do they work? Do they work as well as a prescription drug such as Propecia? We will be discussing these questions and sharing additional information about natural hair loss remedies with you in the following sections. In our first section, we will talk about the process through which many DHT blocking products work. Then we provide our readers with an overview of the known natural DHT blockers and the side effects of using DHT blockers. Last but not least, we will review some products that have DHT blocking ingredients. Below, we feature the top natural DHT blocker products in our comparison chart. In the review section, we’ve identified three popular natural DHT blockers and talk about their robust ingredient lists. 5 What are Natural DHT Blockers? Why Block DHT? In this comparison table, we have put all of our favorite Natural DHT Blocker products for your benefit. We’ve ordered them by cost per month for you, so that you can easily decide which one will best fit your needs, lifestyle, and budget. In our closer look section below the table, we provide detailed information about each product whether it be a shampoo, multivitamin, or supplement. Hopefully our hard work means shopping for the best natural DHT blocker will be a breeze for you. If you’re not sure which product to go with or are just looking for information about each DHT blocker check out our comprehensive list section. Here, we take a closer look at each DHT blocker product in the comparison table above.These products are ordered from lowest the highest cost. These products include at least one DHT blocking herb, sometimes many, and are potent DHT blocker formulas. The hair loss product category is chock full of outlandish claims and false advertising. The main thing you want to focus on is the ingredient list, the quantity of each ingredient, and the manufacturer quality. The quality is probably the hardest to gauge, which is why we’ve only included a few of the more reputable products in our best of list. In this DHT blocker review section, we discuss the top ingredients in each product and why they’ve become popular choices for hair loss prevention. At first glance, this supplement is labeled for prostate health, but do a little more research and you’ll see that saw palmetto is good for a lot more than just that. This is a reasonably priced supplement, that has more health benefits than just being a natural DHT Blocker. In Europe, some hair loss sufferers will strictly use saw palmetto to slow down their hair loss. The highlight of this product is that it contains 45% standardized saw palmetto extract which means you’re getting the real, active ingredient. Groganics is a company offering numerous hair loss products. Most of these products incorporate the key ingredient saw palmetto. Their system may be worth trying if you’re attempting to keep things all natural. Their standalone vitamin product isn’t bad, but we think you can do better as the ingredient list is not as strong as some of the other options. If anything, we’d suggest picking up their shampoo in the featured image or their product bundle. You can buy the three step system as bundle on Amazon for about $30. These products are applied topically, during and after shower. They’ll make your scalp tingle, that’s for sure. Their freeze products include a unique antiseptic and nerve sedative. Other helpful ingredients are chamomile, oat seed extract, and other vitamins to optimize healthy hair growth. They have two different systems: the ‘growth stimulant system’ and the ‘volumizing system’ each with their own three products. You’ll want the growth stimulant system. Here’s a first hand review and account of how Groganics helped YouTube’s PrettyPCollins with Hair Growth. The volumizing system just doesn’t have as a robust ingredient list as the growth stimulant system. The volumizer appears to to aimed at people who have naturally thin hair or who have just started the thinning early stages of hair loss. It includes a shampoo and two scalp treatments. You can read more about it here. If you’re looking at going the shampoo route the ArtNaturals Volume Enhancing Shampoo has a wide array of regenerative natural ingredients. Notable ingredients in this formula include caffeine, argan oil, aloe vera, stinging nettle, burdock root, saw plametto, tripeptide, castor oil, and oleanolic acid. Leven Rose cites emu oil as being used as an alternative treatment to hair loss, however, there isn’t as much quality research done on emu oil. Much of its interactions with hair loss are unknown. While some of the other herbal DHT blockers like saw palmetto and nettle root have more evidence backing them up, emu oil does contain both linolenic and oleic acid which have been shown to have an anti-inflammatory effect and may help combat scalp DHT levels. If you’re looking for a wide spectrum DHT blocker with a ton of biotin this HairOmega formula should be at the top of your list. They’ve thrown everything but the kitchen sink in this DHT blocker supplement. 41 ingredients including a massive dosage of biotin + including saw palmetto, beta-sitosterol, and pygeum bark. Zenwise’s follows HairOmega’s approach and includes many of the same DHT blockers in their vitamin. However, if you closely read their proprietary DHT blocker blend that contains 737 mgs per serving you’ll notice some ingredients that aren’t found in Hair Omega’s DHT Blocker. A topical spray, this Botanical Beauty product contains plenty of oil derived from pumpkin seeds. Back in old times, eating raw pumpkin seeds was a method to prevent BPH (benign prostatic hyperplasia). The Physicians Desk Reference for Herbal Medicines indicates that the DHT blocking properties of pumpkin seed could be due to the presence of rare amino acids like cucurbitin and several plant steroids. You’ll see on the supplement facts label of this formula that the top list is essentially a vitamin supplement and the bottom part of the list is a hair and DHT blocker supplement. He shou wu extract, plant sterols, stinging nettle root, inositol, and saw palmetto are the standout natural DHT blockers in this product. The Shen Min Hair Strengthening DHT Blocker has many of the same ingredients as the NuHair product. This is a potent blend and if you are looking at taking the blanket approach and trying as many natural DHT blockers as you can, this is arguably the best route. The composition is much like NuHair’s tablets. It includes the same saw palmetto, phytosterol complex, pumpkin seed extract, and he shou wu line-up like NuHair. However, Shen Min includes quercetin and beta sitosterol in its proprietary blend of DHT blockers. Beta-sitosterol has been shown to significantly increase the effectiveness of preventing hair loss when used alongside saw palmetto. A study on beta-sitosterol “Effectiveness of Botanically Derived Inhibitors of 5AR in the Treatment of Androgenic Alopecia” in the Alternative and Complimentary Medicine Journal by Nelson Prager showed improved hair growth rates in 60% of study participants as compared to 11% in the placebo group. 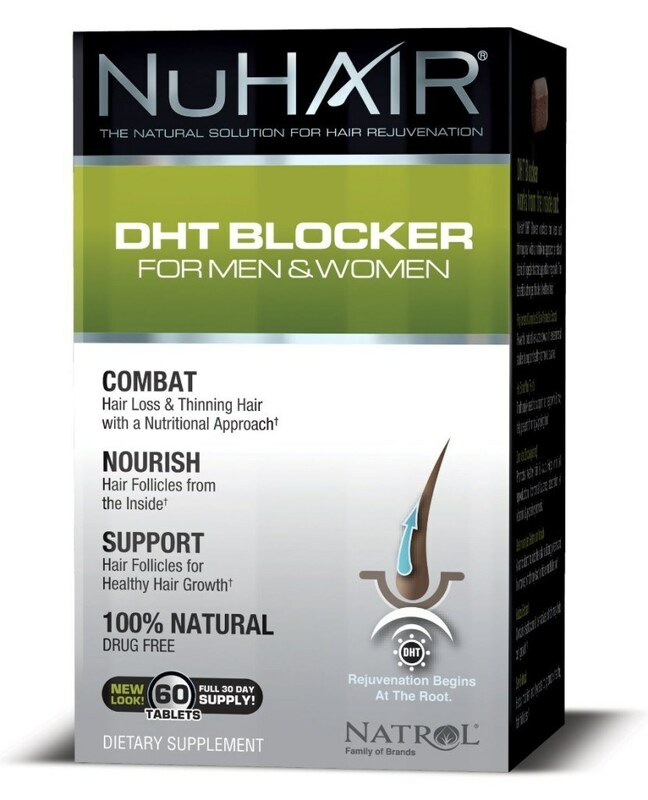 The NuHair DHT Blocker supplement is manufactured by Natrol. NuHair is safe for both women and men. The product contains their proprietary DHT blocking blend. This blend includes a soy phytosterol complex, pumpkin oil extract, and saw palmeto extract. These herbs all made our top 13 DHT blocking herbs list. Furthermore, it contains zinc, additional soy extracts, and he shou wu extract. This is a great hair loss prevention supplement for both women and men. It has received a lot of positive customer feedback. The DHT Blocker Proprietary Complex contains a strong lineup of ingredients: horsetail herb powder, nettle leaf powder, pumpkin seed powder, green tea leaf powder, saw palmetto extract, and inositol. As opposed to many of the other supplements on our list, this formula acts more as a hair vitamin. It will aid individuals with healthy, strong hair growth but isn’t formulated to block DHT as much as the other products on our list. This hair vitamin is a great replacement or safety net to ensure you’re getting all the nutrients you need to grow healthy hair that you may not consume in your daily diet. One of four shampoos on our list, this is our top pick if you have to go with one shampoo. It is a great shampoo for daily use and the 17 key active ingredients list is hard to beat. Plenty of natural oils and DHT blockers combine together to make a powerful formula that is unrivaled in the hair care category. If there is a shampoo that rivals the Pura d’or Gold Label, it is Lipogaine’s Big 5 Shampoo. This all natural hair rejuvenating shampoo is one of the most popular out there. Lipogaine is a trusted brand and makes a strong line-up of quality products including minoxidil formulas, derma rollers, and a Big 3 Shampoo that are also worth checking out. This hair serum uses Good Lab’s proprietary blend of DHT blockers, vitamins, and nutrients that help minimize hair loss and encourage new growth. You’ll find biotin, saw palmetto, nettle leaf, caffeine, and a host of other natural ingredients that work together to prevent further loss. Good Lab also produces a great thickening shampoo and conditioner worth checking out. There are many herbs that have been found to act against DHT. From one to the next, they each interact with the human body differently. Unfortunately there hasn’t been many extensive, long term studies completed on the following list. There are only a select few with significant scientific data. Most of these herbs and other such substances can be easily found and mass produced at low cost. In turn, the profit incentive just isn’t there to organize and follow through on clinical studies and lab research. One thing to note is that while some of these natural remedies may not have data about their hair loss interactions, there may be data about their ability to relieve prostate conditions. Since hair loss and prostate conditions share some of the same characteristics, a herb that successfully cures the prostate likely has a better chance of effecting the hair loss process than one which has no such capability. If you are looking to use one of the following for hair loss, your best bet is to find a reliable manufacturer. Once you identify a trustworthy company, look for a product that contains the herb you are looking for. Keep in mind, you want the extract version of these herbs. An extract is literally a highly concentrated version of the substance, whereby all other chemical constituents of the herb fiber are pulled out or ‘extracted’. In layman’s terms this means you’re getting the real deal and they have the best chance to work. The bottom line is when you buy extract at least you know you are getting your money’s worth. You should approach the domain of herbal supplements with caution, especially if you start mixing and making your own little cocktail. Always consult your doctor first if you have health concerns. It is advisable to check with your physician before starting any new supplement or treatment. Saw palmetto is likely the most popular natural DHT blocker. A lot of evidence has been gathered showing its efficacy in preventing or slowing hair loss. It is a potent herbal DHT inhibitor and considered the best natural DHT blocker by many. Saw palmetto is approved in Europe as a treatment for hair loss. It is also widely used to keep men’s prostates healthy, just like the medication Finasteride. Propecia is the name brand of Finasteride. Both saw palmetto and Propecia are known to be 5-alpha-reductase inhibitors. Saw palmetto is tolerated very well by the majority who take it. Mild side effects such as upset stomach are sometimes experienced by users. Pygeum bark, or Pygeum Africanum is another herbal remedy that has been shown to alleviate unpleasant side effects of benign prostatic hyperplasia (enlarged prostate). Pygeum Africanum is thought to be a hormone balancer. It will aid the user in reducing and regulating levels of DHT. Like saw palmetto, it also partially blocks the action of 5 alpha reductase. Pygeum is known to block another enyzme called aromatase as well. Pumpkin seeds and the derived oil has been discovered to break down DHT via the liver. Eating raw pumpkin seeds was a method in the old days to prevent benign prostatic hyperplasia. In Germany, the regulatory agency that acts like the United States’ FDA is called the German E Commission. The E Commission has approved pumpkin seed oil for the treatment of prostate disorders. The Physicians’ Desk Reference for Herbal Medicines believes the DHT blocking properties are thanks to the presence of rare amino acids such as cucurbitin and several plant steroids. Stinging nettle is a botanical with a long history of human use. Like saw palmetto, stinging nettle is used widely in Europe to treat BPH. There was also a double blind study in 2013 with 100 patients you can read about here. It is sometimes combined with pygeum bark and saw palmetto for a potent blend of DHT blockers. This herbal combination is found to effectively reduce prostate swelling. Since androgenetic alopecia is caused by a similar mechanism (DHT) as prostatic hyperplasia, this blend of herbs has been seen to be particularly effective at warding off hair loss. Beta sitosterol is actually a mixture of phytersterols. These phytersterols have anti-androgenic properties, which are known to fight off DHT. Most plant species contain sterols, for example, even saw palmetto has sterols. Beta Sitosterol actually contains more sterols than saw palmetto. Beta sitosterol also lowers cholesterol levels which is associated with higher DHT levels. It is a completely organic product, and is not known to have any negative side effects. 100% natural emu oil contains a high concentration of linolenic acid. Some research has indicated that linolenic acid is a mild antiandrogen. It is sometimes used to treat acne and hirsuitism. While it may not be the best DHT blocker, many associate using emu oil with promoting new hair growth. The oil is not greasy and can be applied to the scalp at night. Soy Isoflavones are extracted from soybeans. This is another natural DHT remedy that generally comes in tablet form. These isoflavones indirectly block DHT by regulating bad cholesterol. High levels of cholesterol can elevate production of enzyme 5 alpha reductase, which in turn converts testosterone into DHT. Consuming soy products have also been shown to regulate hormones, increase bone strength, promote cardiovascular health, and seen to have positive effects on the prostate. This is a good DHT blocker for women as it reduces the risk of breast cancer, prevents osteoporosis, and protects against uterine cancer. Some research has indicated that epigallocatechin 3 Gallate (EGCG), one of the active components of green tea, also blocks the formation of DHT. At Harvard Medical School, a team of scientists reported in an issue of The Journal of Nutrition that green tea had significantly decreased DHT and testosterone concentration in the blood. A more recent study was conducted by British researchers. This was published in a peer reviewed medical journal Cancer Prevention Research in 2009. It found that EGCG decreased cell proliferation in cancerous prostate cells by inhibiting DHT. This is a botanical that has been shown to block DHT by inhibiting 5 alpha reductase. However, the documented success thus far is limited to cultured skin cells. Giant dodder has yet to be clinically studied on humans. The study, which was published in September of 2008 issue of the Journal of Cosmetic Dermatology, showed DHT conversion was prevented when giant dodder extract was added to skin cells taken from mice with testosterone induced alopecia. Known by the scientific community as centella asiatica, the gotu kola herb has been used in India, China, and Indonesia (particularly in Ayurveda and Brahmi medicine) to treat many conditions for thousands of years. It has been used for things from anti-aging to a cure for diabetes. One of its constituents, called asiaticoside, has been found to stimulate and repair hair, nails, and other connective tissues. A study that was published in March 2011 of the International Journal of Pharmacy and Pharmaceautical Sciences concluded that gotu kola extract increased hair length and density in rats. It is thought to improve blood circulation to the hair.While no definitive human studies have been completed, many herbal hair loss products will include this ingredient in their mix. Known as ‘nature’s viagra’, this is a male tonic that increases libido and strengthens sexual function. It is sometimes called ‘potency wood” as it is found in bark in certain trees native to the Amazon rain forest. It has been used for a long time in South America for mainly impotency, but reducing hair loss and balding was found to be another helpful benefit. Known formerly as Siberian Ginseng, Eleuthero is utilized in many healthy hair supplements. It is also known to reduce hormones that are related to stress. It is used as a herbal antioxidant in Russia and China, but also as a natural hair loss cure. To date, there is no clinical proof of its positive effects on preventing hair loss. Some hair loss product manufacturers will promote L-Lysine as a DHT blocker. That is not the case. It has no androgenetic properties. However, researchers have found that those that supplement DHT inhibitors with L-Lysine get better results. It was used by patients taking Propecia and found to bolster their results when compared to the control group. Herbal also known as natural DHT blockers generally fall into two broad categories. Shampoos and oils are applied to the scalp topically. Oils are typically applied to dry hair and scalp while shampoos of course are used daily in the shower. Remember, quality oils are both 100% natural extracts and certified organic. Natural DHT blockers also come in multi-Vitamins or supplement form. They have a range of active ingredients. Your choice may come down to brand preference, or what the product is targeting. Some products are aimed to promote and increase healthy hair growth while others are designed to block as much DHT as possible. What are Natural DHT Blockers? Why Block DHT? It is known that the main antagonist in the fight against genetic hair loss is DHT. DHT is short for dihydrotestosterone. Therefore, the principal part of anyone’s hair loss prevention regime should be DHT blockers. The conversion of testosterone to dihydrotestosterone and the hormones’ interactions within the human body is believed to not only shape the progression of balding, but also play a role in benign prostate hypertrophy (enlarged prostate) and even prostate cancer. There are many shampoos, vitamins, and ‘hair loss pills’ that are being sold these days with some pretty wild claims on their effectiveness in halting the conversion process of testosterone to DHT. The evidence is cloudy to say the least. It is still very much up to the individual to run their own trial and error. All of the above are considered methods of DHT-blocking. Why block DHT? Well if you are interested in keeping your hair in top shape, blasting DHT should be your part time job. You can stop, slow, or even reverse hair loss by following a daily regime that attacks DHT from multiple angles. The fact of the matter is DHT will continue to bind the hair follicle cell receptors until the hair gets thinner, finer, and eventually falls out. When the strand of hair gets very fine and wispy you know the responsible hair follicle underneath the scalp is nearing the end of its life. A dormant hair follicle that was damaged thoroughly by DHT will no longer produce hair. It is much harder to get a hair follicle that has been dead for a long time to produce thick, healthy hair than it is to reinvigorate a hair follicle that is still producing thin hair. Think of it like doing preventative maintenance on your car. If you do the little things along the way you’ll have a full head of hair later into your life. But if you let it all go to the wayside then you have to pay big time for a new engine. In the realm of hair loss, that is comparable to paying for something extreme like hair transplant surgery for example.